Often, foreign companies are involved in patent litigation in Germany. 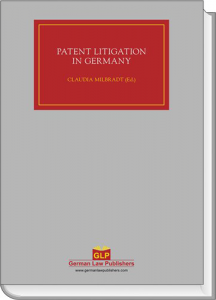 The goal of this book is to focus on patent litigation in Germany while still touching a broad scope of issues in a way that gives the practitioner a quick overview. The book starts with the chapter on the European Patent with unitary effect and its Enforcement. Particular emphasis of this book is put on the broad field of patent infringement, questions regarding the scope of patent protection, different forms of infringement, the strategic choice of offensive and defensive legal actions as well as their interaction with and the course of nullity proceedings. Furthermore, questions regarding antitrust law and possible IP arbitration proceedings are addressed. This entry was posted in Titel on Friday November 15th, 2013 by admin.